The Chippewa Men's 25405 USA-Made Waterproof Steel Toe Brown Boots offers: safety, durability, comfort, and style. The leather uppers are Bay Apache, a color that looks like it sounds. They're full-grain leather; not just because leather looks so good, but because ... (see full details) (see specifications) #CHP25405. 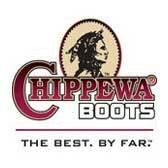 The Chippewa Men's 25405 USA-Made Waterproof Steel Toe Brown Boots offers: safety, durability, comfort, and style. The leather uppers are Bay Apache, a color that looks like it sounds. They're full-grain leather; not just because leather looks so good, but because its layers make it durable and offers you with protection from abrasions and outdoor elements. Leather is also breathable allowing for ease of movement - that means comfort! The waterproof system in the men's boots comes with a one-year guarantee. It's a high-tech membrane construction called Chip-A-Tex. The interiors of the Chippewa boots are lined with the Ruby Dri-Lex system, which is nylon with excellent moisture-wicking capabilities, and it's long-lasting and very breathable. The Goodyear leather storm Welt construction provides years of durability. The rugged soles are made to be easily replaced for those hard working folks, like you, who walk all day long. These durable soles are easily removed and replaced for an even longer lifespan for the waterproof boots. Safety! That can't be overlooked. Steel toe protection and rubber soles are in place to protect you against electrical hazards and slippage. You'll also have chemical- and oil-resistance when you're wearing these EH boots. The soft footbeds are removable for your convenience and the Vibram Tacoma yellow plus logger soles are filled with tiny pockets of air for insulation and shock-absorption. The working person's feet and joints can take a beating day after day. Protect yourself with these steel toe boots and be energized even at the end of the day. Working Person's Store offers you with these Chippewa Men's Waterproof 25405 EH Steel Toe Brown Insulated Boots. Don't miss this opportunity to have safety, comfort, durability, and style - all in one pair of USA-made boots! Chippewa Boots: Men's Insulated Waterproof 25405 EH Steel Toe Brown Work Boots is being added to your cart.